Nowa Amerika is a kind of Polish-German trans-border “United States”. Yes, Nowa Amerika translates to New America, but this name is actually in “nowoamerikański” or “nowo-amerikanisch” language (new american language). It is a kind of mix German and Polish. In pure Polish it would be “Nowa Ameryka” with “y” as second to last letter. Nowa Amerika was founded at a clandestine meeting in March 2010. Nowa Amerika is a federation made up of the four partial states of Szczettinstan, Terra Incognita, Lebuser Ziemia, and Schlonsk. The borders of Nowa Amerika are fluid. Sometimes the boundary expands from Poznań to Berlin, at other times it shrinks. However, the spine of Nowa Amerika is the former German-Polish border, consisting of the rivers Oder and Nyße. Nowa Amerika’s maps are oriented unconventionally: East is on top; West is below (though the north/south axis also plays a not insignificant role in the country’s relationships and activities). The size of Nowa Amerika depends on the number of people who believe in it, it is as simple as that. The flag of Nowa Amerika (shown above) displays the river Oder in the middle in blue, the colors red and white are for Poland, and black, red and gold for Germany. The four stars indicate the four partial states of Nowa Amerika, Szczettinstan, Terra Incognita, Lebuser Ziemia, and Schlonsk. The blue triangle represents the lagoon in Stettin or Szczecin. 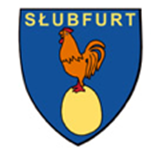 The cultural capital of Nowa America is Słubfurt or Slubfurt (if you are not familiar with the Polish font) a combination of the German city Frankfurt an der Oder and Słubice. Słubfurt consists of two districts, Slub and Furt, hence the name Słubfurt. But this virtual town does not appear on any official map. It was created to revitalize relations between Poland and Germany and to attract tourism. Before 1945 these two cities formed a single town. Nostalgia played a big part in reverting back to making these two cities one again. A rooster was part of the coats of arms of the former two cities Frankfurt and Słubice, and it now became to be the connecting symbol unifying the two cities. Two Euro buys an ID card for Nowa Amerika. You can download the form on the internet, go to the local copy center and have it laminated. To avoid inflation, the ZeitBankCzasu (time bank) introduced a regional currency to be used as barter for time and services. “I show you how to cook, you teach me Polish.” Two local students came up with the design for the currency. “Minutyn” and “Studzina” are the names of the Polish-German currency creation you can use to barter in Slubfurt. ‘Minutyn’ (minutes) is a mixture of the German word ‘Minuten’ and the Polish equivalent ‘minuty’. ‘Studzina’ combines the German word ‘Stunden’ (hours) and the Polish ‘godzina’. Both mean ‘hours’. So, you can buy 15 minutes of gardening, dog walking against other services. The new town Slubfurt has, of course, also a new language, called ‘slubfurthish’ or ‘słubfurtian’. It is a mixture between Polish and German. You speak it by using a few words in Polish, then you switch to German, then back to Polish. When you listen to a conversation and you only know one of the languages, the spoken language mixture should give you enough words so that you are not left out of the conversation. The entire pedestrian zone in Słubfurt can be considered a dictionary. On your way to do your shopping, you can almost learn a new language. On the pavement you see words written in both German and Polish and the respective translation on the pavement. Not easy words, but interesting ones. This should help visitors learn either Polish or German. Słubfurt also held local elections and everyone – including minors, foreigners and unregistered voters – were allowed to vote. This election was only possible because Słubfurt is not a real town, but a virtual one. As a result of these elections, Słubfurt now has its own local ‘parliament’ ready to build a common German-Polish future. This ‘parliament’ decides on important questions for the town. For example, it ruled in favor of a plan to build a cycling track to cross the river Oder, as well as a publication of a tourist guide for the town. It also wants to create a bilingual television channel. If grants become available, there is a real possibility that some or all of these projects become reality.